Home » BJJ Belts & Promotion » Why do some BJJ belts have stripes and what do they mean? Why do some BJJ belts have stripes and what do they mean? All BJJ belt ranks can be divided up into degrees using stripes. These are usually just called “stripes” on every belt except black belt. These are represented as stripes of white athletic or electrical tape around the black bar that’s at the end of the belt. The standard system is to award four white stripes on each belt below black belt before promoting the student to the next belt. How and when stripes are awarded varies widely from school to school, with some schools not even using them, or only using them irregularly. Some schools award stripes based on time (such as every 4-6 months), or as recognition for accomplishments like winning a medal or showing marked improvement. A few schools have tests to earn belts, though this is rare. The decision to award stripes or not ultimately falls on the instructor. Every promotion to a new degree in the black belt is only valid starting from the issuance of an IBJJF diploma, after the applicant meets the basic requirements present in Article 5. 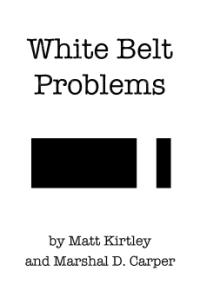 The first degree can only be requested after a minimum of three (3) years of the black belt graduation. The second and third grades can be requested only after a minimum period of three (3) years from the previous graduation. The 4th, 5th and 6th grades can be requested only after a minimum period of 5 (five) years from the previous graduation. The 9th degree (red belt) can only be applied after a minimum period of 10 (ten) years from the previous graduation. The 10th grade (red belt) was given only to the pioneers of Brazilian Jiu-Jitsu, the Gracie brothers: Carlos, Oswaldo, George, Gaston and Helio. The IBJJF has presented three suggested variations of the stripes system for kids (ages 4 to 15). Kids ranks are explained here: What are the BJJ belt ranks for children?